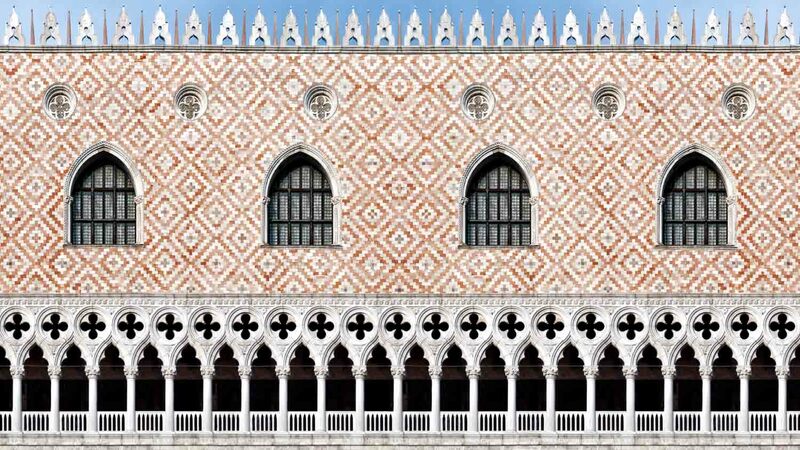 Enjoy skip-the-line entry to the Doge’s Palace: a symbol of Venice and its history, and a breathtaking architectural masterpiece. 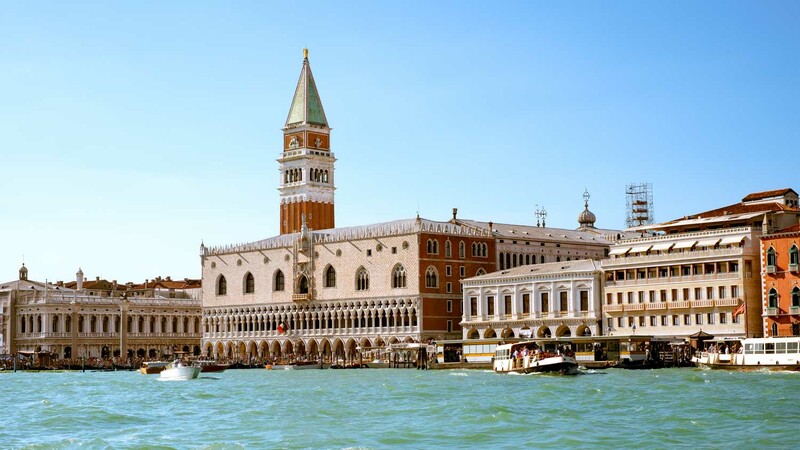 The Doge's Palace, now a famous museum, was once the seat of power of the Venetian Republic. With its ornate Gothic facade, beautifully frescoed interiors, and gilded ceilings, it's a wonder to behold – here are five of its architectural highlights. Filippo Calendario, the mastermind sculptor and architect, designed the gorgeous columned arcade in the palace's facade and also sculpted many of its marvellous statues. 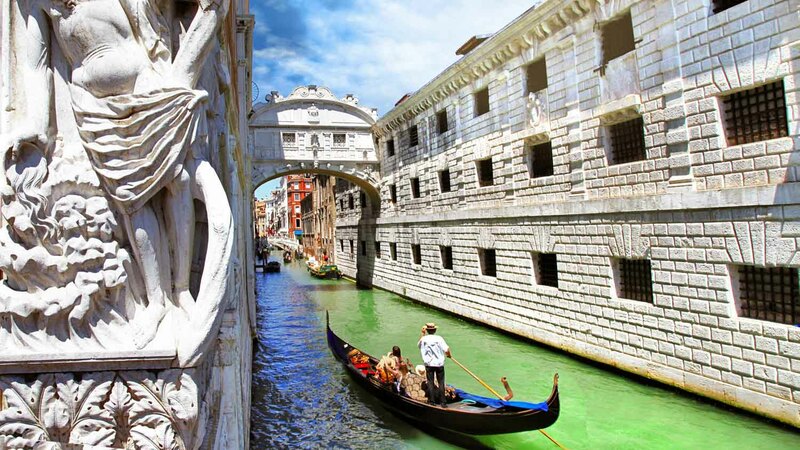 One of Venice's most famous landmarks, this enclosed bridge was a passageway for convicts leading from the interrogation rooms inside the palace to the prisons across the canal. 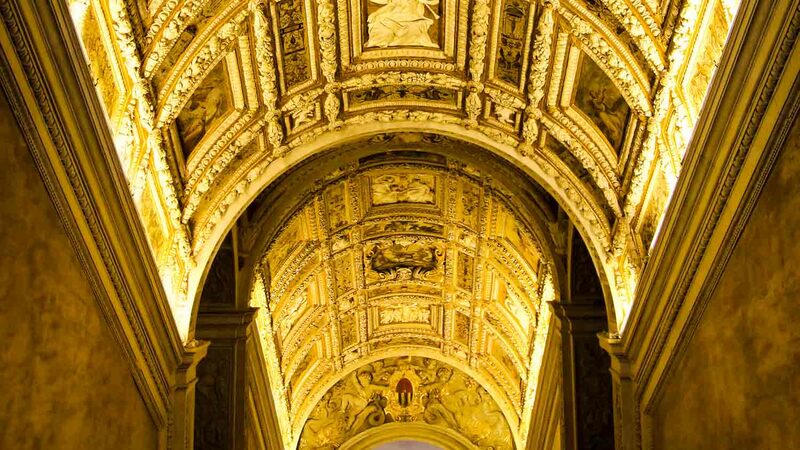 Built to impress, this staircase with an opulently gilded stucco ceiling offered visitors a majestic entrance to the Doge's apartments on the upper floor. Lavishly decorated with ornate ceilings and fireplaces, the Doge's apartments also hold a priceless collection of Renaissance paintings by the likes of Titian and Giovanni Bellini. Designed to showcase the magnificence of the Republic, this large hall is full of artistic masterpieces, including Paradise by Tintoretto, the largest oil painting in the world. 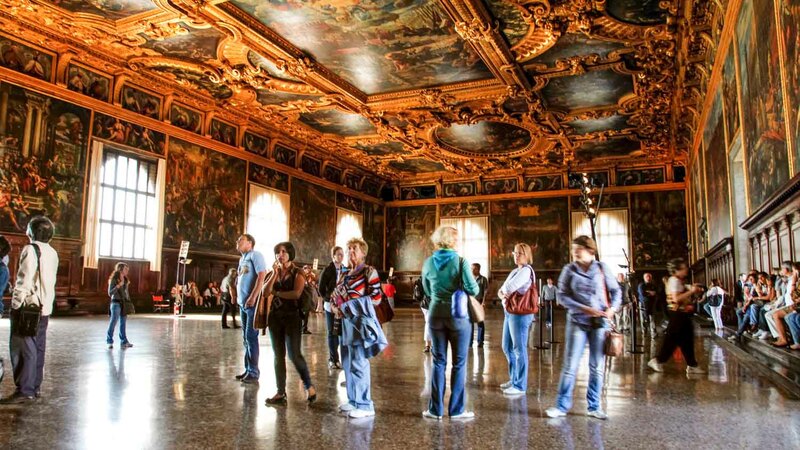 If you want to make the most of your visit to the Doge's Palace, taking one of the tours is a good idea. Not only is it the best way to discover all about the rich history that ran its course within the walls of the palace, but it also offers access to some otherwise restricted areas. Note that some of the more popular tours may require booking in advance. If you're over 65, don't keep it to yourself – make sure to say so when buying your ticket, you'll enjoy a €7 discount! Around €16, but prices depend on the time of year. The Doge's Palace can be found on St Mark's Square. Flash photography is not permitted inside the museum. Backpacks and other chunky items must be left outside with a clerk, free of charge. This was well worth the $. The reason is you skip the incredibly long lines out side , although when you get in they seem to have a difficult time deciding which line you are in?? The palace is so interesting and just unbelievable artwork; but I enjoyed the prison section the most, go figure. An exceptional tour in an exceptional place with an exceptional guide! Learning about the treasures of Venice from a native Venetian was a wonderful experience. Thank you so much to Roberta for all of her knowledge and warmth. I would highly recommend this tour. We thoroughly enjoyed our tour. Our guide (Virginia) was very knowledgeable and was able to answer all questions asked in addition to very detailed explanations of what we were seeing. The crowds were massive and the time in St Marks Basilica is limited but it was worth the effort. The audio system worked well and we were able to hear everything our guide was explaining. Interesting 5our behind the scenes of the palace. Lovely guide with good sense of humour , interesting tour seeing hidden places. Everyone in the tour was given a little device with headphones to hear the guide better. Good experience. Well organized. Excellent tour guide. Line skipping privileges saved time. There was longer lines that we walked past. Tour guide was very knowledgeable, interesting and accommodating to questions.